Get location-by-location performance data, receive alerts for negative reviews, and recognize problems before they become major issues. 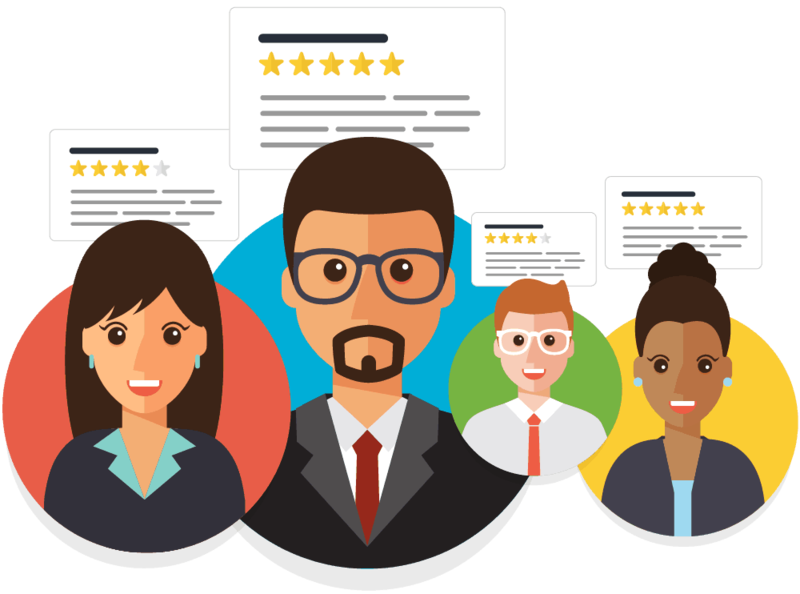 Use ReviewTrackers’ sentiment analysis algorithm along with review data to gain a better understanding of your customer. Higher star ratings improve your search rankings and drive more foot traffic to franchise locations. Monitoring online reviews gives franchises the ability to track operations at each location, gain customer insights, and improve each franchise location’s SEO performance. Reviews allow you to see what your customers see, make changes, and get results. Andy Moore, director of communications at Hwy 55, uses ReviewTrackers to understand what it’s like to sit at one of the tables at his 100-franchise business. ReviewTracker’s sentiment analysis spotted an issue: the waitstaff was not getting to the tables fast enough. Moore swung into action, initiating new training for his staff and streamlining his greet-and-seat process. The results? Hwy 55 increased its rating from 3.8 to 4.1 stars. The amount of calls to the restaurants increased 43 percent, and the number of Google Map searches that resulted in customers taking a trip to Hwy 55 increased 76 percent. Moore’s lesson: if you listen to customers, you’ll get real results. ReviewTrackers can be set up however your franchise operates to make sure the right people have the right access to the features they need. ReviewTrackers can give regional and local managers limited access to review response and request tools. At the same time, corporate marketers can see the entire landscape of your franchise’s reviews in one dashboard. With API syncing, in-store kiosk options, and SMS review requests, ReviewTrackers fits nicely in any marketer’s toolbox. In our annual report on local search, ReviewTrackers found that 35 percent of all search traffic is now local — and one of the major factors for local search is online reviews. 4. Sentiment in the text of reviews. Our review monitoring software is built to track each of these areas. For us, it’s not about building a cheap and easy solution to manage reviews; it’s about building technology that provides franchises with the best way to improve local search visibility and review performance. Each franchisor has specific concerns about operations. If you want to make sure franchisees are meeting the customer service standards set in a Franchise Disclosure Document, one way to do so is to monitor reviews. You can set up alerts for negative reviews and tag any reviews that mention cleanliness, compliance issues, food safety, or other topics that a franchise group or franchisor may want to keep an eye on. Customize your workflow to fit your franchise structure. For example, regional managers can get alerts for every negative review, while individual franchisees are in charge of responding directly to their customers. Track your reviews by region, franchise group, or individual location to watch performance over time. 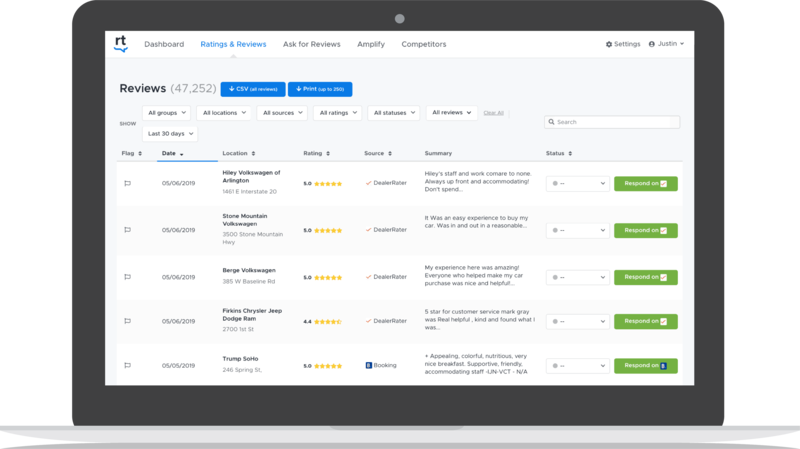 ReviewTrackers' algorithm spots operational issues, helping you make the changes your customers want. ReviewTrackers’ software can sync with your POS system, API, and other franchise marketing software to make it easier to contact customers and ask for a review. Ensure a consistent experience across your franchises by keeping track of reviews at all locations. Know immediately when locations are underperforming and make proactive changes.